Great teams aren't just thrown together. Teamwork is a result of the right combination of individuals with the right complement of skills. 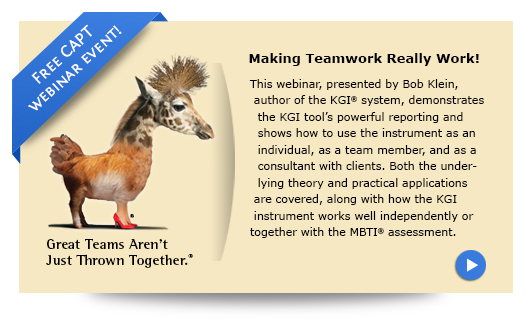 The Klein Group Instrument® (KGI®) assessment was created to assist people in acquiring a broad range of interpersonal and task-execution skills to help them more effectively participate in teams, in both leadership and membership roles. The KGI is a comprehensive 4-in-1 assessment instrument that can be taken by individuals or entire teams. Individuals receive a detailed report indicating their strengths and challenges in four domains (leadership, negotiation, task focus, and interpersonal focus), further subdivided into nine subscales. Teams receive an aggregate score on the same scales and subscales, with additional feedback on the variation in scores of its members. Individual reports provide very targeted feedback and suggested actions for improvement. Group reports include both specific, prioritized group process improvement suggestions and a plan for implementing them. A combination of personal profiles plus the group's profile for an entire team gives members a deeper appreciation for the varied roles and functions essential to true teamwork, with actionable insights about productive next-steps provided for both group and members. The KGI is unique to team-focused assessments, targeting both outcomes (task analysis, planning, and execution) and process (conflict resolution, negotiation, and emotions). Human Resource (HR) professionals, consultants, educators, counselors, psychologists, school psychologists, coaches, training and organizational development specialists, career counselors, clergy, managers, and anyone working toward personal, peer, or employee development. In the event that CAPT must cancel a class we will give you as much advance notice as possible. CAPT will make every effort to accommodate your needs and rebook you in a different class. CAPT is not responsible for any travel expenses that may occur from the cancellation of a scheduled class.